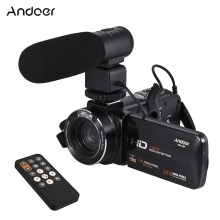 Thank you for purchasing Andoer HDV-Z20 portable video camera! This camera can be used to shoot videos as well as take photos. Additionally, it supports SD cards of up to 64GB capacity to extend the memory of the DVR camera. Sent with a professional external microphone for recording crystal clear sound effect. Digital camera with 8 mega-pixel CMOS sensor, can provide 1920 * 1080 30fps FHD digital video resolutions and max. 24M (5600 * 4200) photo resolution. An aluminum alloy external mic with NCR noise reduction, 3 levels anti-shake design and windscreen to minimize environmental noise, you can record crystal clear sound effect. Support 16X digital Zoom/ Anti-shake/ Face Capture functions. Support LED light-compensating lamp for shooting at dark condition. 3.0" rotatable TFT LCD touchscreen. Connect the camera with smartphone APP via WiFi, then you can control it with smartphone, such as take photo, zoom & transfer photo etc. You can control the camera with multi-functional controller included. Internal high sensitivity microphone and speaker; with hot shoe mount for video accessories like external mic/LED light. With High-Definition Multimedia Interface output and cable for data transmission. It is a nice recorder for your daily life, capture happy moments and store it as the best memory. Please remove the plastic sticker on the camera/controller battery when you receive the package, otherwise the camera/controller cannot be power on.